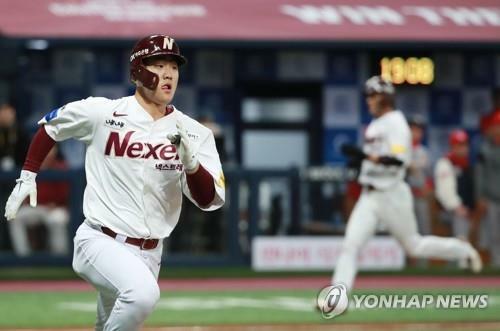 SEOUL, Oct. 30 (Yonhap) — The Nexen Heroes will live to see another day of South Korean postseason baseball, after earning a nail-biting win on Tuesday. 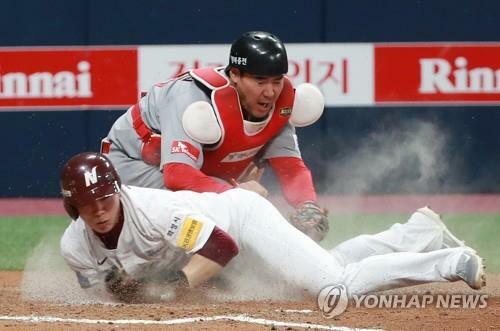 The Heroes defeated the SK Wyverns 3-2 at Gocheok Sky Dome in Seoul to stave off elimination in their second round playoff series in the Korea Baseball Organization (KBO). Song Sung-mun drove in the go-ahead run with a sacrifice fly in the top of the fifth inning, and starter Han Hyun-hee was solid in 5 1/3 innings for the Heroes’ first win of the best-of-five series. The Wyverns are still ahead 2-1 in the series and can finish off the Heroes in Game 4 back at the dome at 6:30 p.m. Wednesday. The Heroes are trying to do what only two teams have accomplished — overcoming a 2-0 series deficit in the penultimate round to reach the Korean Series. The Wyverns scored 12 of their 15 runs in the first two games with home runs. And that trend continued Tuesday, with cleanup Jamie Romak smacking a solo homer to put the Wyverns on the board in the top of the second. Leading off the second inning, Romak drove a 0-1 fastball from starter Han Hyun-hee over the right-center field wall for his first postseason home run. Romak went 1-for-9 without an RBI in the first two games of the series. The Heroes responded with some small ball in the bottom of the second. After a walk and a single put men at first and second with one out, Lim Byeong-wuk hit a ground ball to first to advance the runners. Then No. 9 hitter Joo Hyo-sang, making his first start of the series, rolled a single down the right field line to bring both runners home and put the Heroes ahead 2-1. The ball wasn’t hit hard, but just as first baseman Park Jung-kwon moved toward the line, the ball took a funny hop and rolled through the space between Park’s glove and legs. The Wyverns tied the score at 2-2 in the top of the fifth with — what else — a home run. This time, No. 8 hitter Kang Seung-ho sent a solo shot over the left field fence, also his first long ball in the postseason. Kang’s blast ended Han’s string of consecutive batters retired at 10. The next batter, Park Seung-wook, hit a towering fly that went off the top of the left field fence, and was thrown out trying to stretch it to triple. That base running gaffe — Park hesitated for a moment before going for third base — got the Heroes off the hook and gave them a new life. And in the bottom half of that inning, the Heroes reclaimed their one-run lead. And again, they did it without the benefit of a home run. Kim Hye-seong led off the frame with a triple through the right-center gap, and scored the go-ahead run on a sacrifice fly by the next batter, Song Sung-mun. The Wyverns failed to cash in on a bases-loaded opportunity with one out in the top sixth, when pinch hitter Jung Eui-yoon grounded into a 5-4-3 double play. Han gave up a leadoff double to Kim Kang-min, and two batters later, Choi Jeong’s single put men at the corners. Han hit Romak to put three runners aboard, and was pulled in favor of left-hander Oh Ju-won. Oh was called in to face left-handed batter Park Jung-kwon, but SK sent in a right-handed pinch hitter Jung Eui-yoon instead. And Oh took care of business by inducing the inning-ending double play ball. The Wyverns squandered another opportunity in the eighth inning. Kim Kang-min greeted new pitcher Lee Bo-geun with a single and then stole second to get himself into the scoring position for three big boppers behind him. With the game and the season on the line, Lee struck out those three sluggers in a row to escape the jam. Han Dong-min, Jamie Romak and Choi Jeong, who combined for 119 home runs this regular season, all went down swinging, the latter two on Lee’s signature forkball. The Heroes’ much-maligned bullpen — which blew a league-worst 23 saves in the regular season — stood its ground in this one. Closer Kim Sang-su got three quick outs in the ninth for the save, and punctuated the victory by striking out Kim Dong-yub to end the game. Nexen manager Jang Jung-suk made a few lineup changes for Game 3, inserting little-used second baseman Kim Hye-seong into the leadoff spot. Kim hit a triple and scored the winning run in the sixth inning. 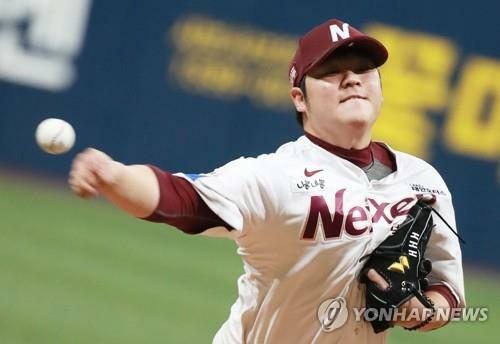 Jang also pushed all the right buttons with his bullpen, which blanked the Wyverns over the final 3 2/3 innings. The Heroes will try to even the series Wednesday with rookie left-hander Lee Seung-ho on the mound. In his previous postseason start in the first round, Lee gave up two runs in 3 1/3 innings against the Hanwha Eagles. He had a 15.00 ERA against the Wyverns during the regular season. The Wyverns will counter with right-hander Moon Seung-won, who was 2-2 with a 4.91 ERA against the Heroes during the regular season. Moon came out of the bullpen in Game 1 of this series and was charged with two earned runs on two hits, including a home run, in 1 1/3 innings.